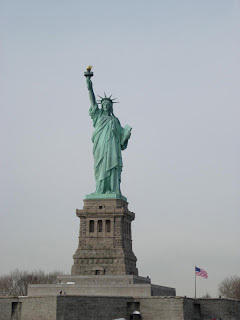 If you come to United State, You must visit New York. There are many interesting tourist attractions to be explore. New York, the largest city in the U.S., is an architectural marvel with plenty of historic monuments, magnificent buildings and countless dazzling skyscrapers. Besides the architectural delights, New York is an urban jungle that has everything to offer to visitors. The city is home to numerous museums, parks, trendy neighborhoods and shopping streets. The Statue of Liberty has become an American symbol of freedom and welcome to the immigrants who come to the USA looking for a better life. It's the popular tourist attractions in New York. The crown of Lady Liberty, as the statue is often affectionately called, has seven spikes, symbolizing the Seven Seas across which liberty should be spread. In her left hand she holds a tablet with the Declaration of Independence and in her right hand a torch, symbolizing Enlightenment. The Empire State Building has captured the attention of young and old alike: every year, millions of tourists flock to the Empire State Building. You can visit the Empire State Building's observatory on the 86th floor from where you have a magnificent view over the city of New York. 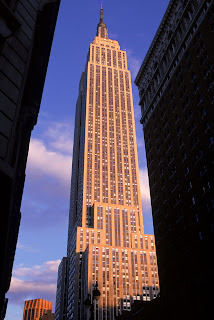 The Empire State Building is situated south of Midtown, away from the skyscraper clusters in midtown and in the financial district downtown, so this is one of the few places in Manhattan where you have an open 360 degrees view. The Brooklyn Bridge, built between 1869 and 1883, connects Manhattan with New York. 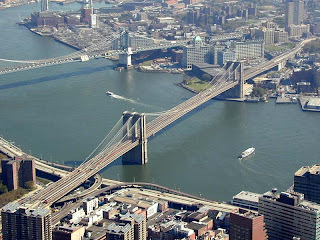 The bridge is one of the most magnificent tourist attractions in New York. The impressive bridge spans the East river between Brooklyn and Manhattan and stretches for a length of 5989 ft, about 1.8 km. The length between the large towers is 1595.5 ft (486 meter). This made the Brooklyn bridge the world's largest suspension bridge. The American Museum of Natural History presenting exhibits to the general public in the Central Park Arsenal building more than 30 years ago, American Museum of Natural History has been devoted to bringing the public cutting-edge anthropological and natural history information and displays - profiling both the past and present. From giant dinosaur skeletons to a state-of-the-art planetarium, the four floors of the museum are a giant playground for both adults and children, especially those who love animals and science. located in the center of Manhattan. Its design is an example for city parks around the world. 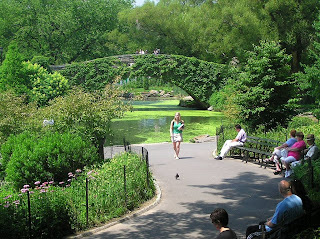 Central Park is situated in Manhattan between 59th and 110th street and between Fifth and Eight Ave. The park offers several lakes, theaters, ice rinks, fountains, tennis courts, baseball fields, many playgrounds and other facilities. 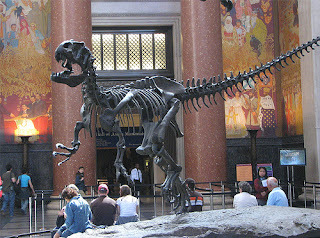 It is also home to the Central Park Zoo and the Metropolitan Museum of Art. Especially during the weekends, when cars are not allowed into the park, Central Park is a welcome oasis in this hectic city. Chrysler Building regarded as one of America's greatest buildings, and the Chrysler Building is often on the cover of architectural books and magazines. 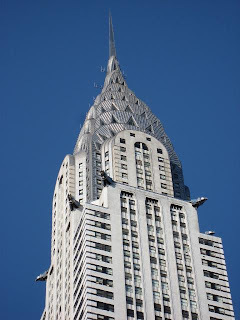 The Chrysler building is one of the last skyscrapers in the Art Deco style. The gargoyles depict Chrysler car ornaments and the spire is modeled on a radiator grille. Since it was restored in 1996 it glitters again like it must have in the 1930s. And the building's Art Deco interior is even more magnificent than its exterior. The marble floors and many Art Deco patterns such as on the stylish elevator doors make the Chrysler Building one of New York's most beautiful office towers. 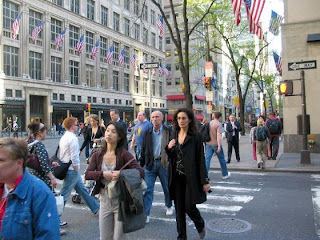 There are enough over-the-top shopping opportunities on Fifth Avenue to satisfy everyone's taste. Women will love browsing and buying at stores like Bergdorf-Goodman, Louis Vuitton, Prada, Emanuel Ungaro, Gucci, Ferragamo, and Versace. Men can check out Bergdorf Men, Brooks Brothers, the NBA Store as well as the famous Apple Store. Place to looking for something shiny or sparkly such as jeweler to the stars, Bulgari, Cartier, Tiffany and Company, Van Cleef and Arpels, and Fortunoff. Madison Square park is bordered by Fifth and Madison Avenues and 23rd and 26th street. 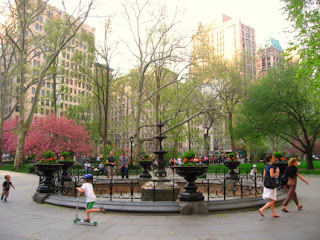 Since its rededication in 2001 this park is once again one of the most enjoyable parks in Manhattan. From anywhere in the park you have a great view on the surrounding architectural landmarks. 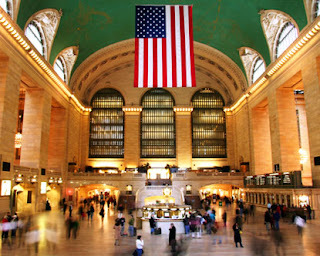 Grand Central Terminal is one of the greatest railway stations in the world. Grand Central Terminal is a beautiful Beaux-arts building in midtown Manhattan. First opened in 1913, Grand Central Terminal underwent a massive restoration to restore it to its former glory, and is now both a transportation hub, as well as a destination in itself for visitors to New York City. If you want to see the New York Harbor up close. 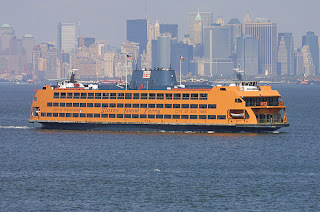 The Staten Island Ferry serves commuters traveling between Staten Island and Lower Manhattan. The Staten Island Ferry is an attraction fit for young and old. Take the staten island ferry you can enjoy a wonderful view of the harbor and all it has to offer. Among the sights to take in from either side of the vessel, are Governors Island, the Statue of Liberty, the Brooklyn Bridge, lower Manhattan and Wall Street's skyscrapers, Ellis Island, and the Verrazano Narrows Bridge connecting Staten Island to Brooklyn.